The all aluminum V10 Viper engine is the largest high performance production car engine being manufactured in the world today and one of the most powerful high performance engines ever built for a production sports car. There are three generations of Viper production car engines and several versions of GTS-R and Competition Coupe race engines. 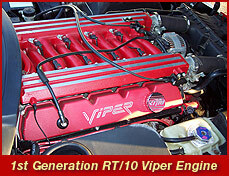 The first generation Viper engine was manufactured from 1992-1995. The displacement is 488 cid with power rated at 400 horsepower and 450 foot-pounds of torque. The 1996 model year Viper received improvements to the exhaust system and the 1st generation RT/10 engine increased power to 415 horsepower and 488 foot-pounds of torque. 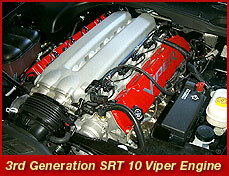 The second generation Viper engine was produced from 1996 to 2002. 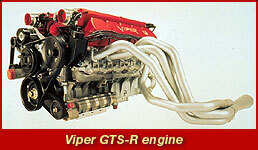 This engine was introduced in the new 1996 Viper GTS car model and later used in all RT/10 and GTS models from 1997 to 2002. This engine is also 488 cid and approximately 80 pounds lighter, with revised cylinder heads, camshaft and engine block. The 2nd generation engine power output increased to 450 horsepower and 490 foot-pounds of torque. The Viper ACR is equipped with the most powerful 2nd generation production Viper engine producing 460 horsepower and 500 foot-pounds torque. The addition of smooth bore intake hoses and a free-breathing air filter provided 10 extra horsepower for the ACR Viper engine. 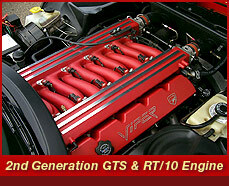 The third generation Viper engine was produced for the 2003 Viper SRT. Engine displacement is 505 cid and the power output is rated at 500 horsepower and 535 foot- pounds of torque. better valve location and a larger reshaped combustion chamber design. with three levels of performance. The base GTS-R race engine is rated at 525 hp with 650 and 700 hp versions available from the factory. 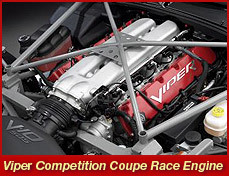 The Dodge Viper Competition Coupe's engine is rated at 520 hp, which is 20 more horsepower than in the stock Viper. This rating is considered conservative and the power output can actually be closer to 550 hp.